Kids are naturally curious. A microscope can change their life. The best microscope for kids depends on the age of your child. We show you a range of fantastic options. Children are naturally curious. What better way to nurture that curiosity and instill a love for science and exploration than with a microscope of their very own? I loved science as a child and had I owned a microscope I may have gained further interest and fascination as I grew older. I want my children to have that opportunity so I started looking into different options for the best microscope for kids and came across some valuable information along with some great ideas on which ones to choose from. What’s the Best Microscope for Kids? We review fantastic microscopes for a variety of ages. A microscope for kids may not be the first thing that comes to mind when considering a unique gift idea, but it has many educational qualities. Rather than another video game or digital toy, a microscope can encourage hands-on activities that introduce children to biology and incorporate an appreciation for the field. It opens a world of opportunity for kids to learn more about their favorite things such as the biology of a butterfly or a clover. It also helps them express creativity as they find new things to examine with it. A fine-grade microscope can also serve a child well into their teens or even adulthood to study things for school-related purposes. First thing you should know when venturing out to buy a microscope for children is that there are two basic types of light microscopes- stereo and compound. Each of these microscopes possess their own features that sets them apart for different purposes, so which one is the right choice for your child will depend on a couple of factors. One of the biggest differences between these two types is what they allow you to observe. For instance, a stereo microscope is a suitable choice for looking at larger objects such as insects or plants. That is why they are also sometimes called dissecting microscopes, because they are preferable for observing dissected animals. A stereo microscope typically uses a top light source to give you better visibility of a 3D object. A compound microscope, however, is more ideal for observing things at the cellular level. These would be preferable for looking at slides of specimens. They also have greater ability to magnify objects for further clarity. A compound microscope typically has a bottom light to shine through specimens that are prepared on a glass or plastic slide. A toy microscope is closer to being a fancy magnifying glass. Which is better for children? Given the information on the difference between compound and stereo microscopes you may be questioning which is the better microscope for kids. The two biggest deciding factors that will determine this is the age of the child who will be using it in addition to their particular interest. For younger children under the age of 10, stereo microscopes are most likely the better option as they are simpler to use. Likewise, the things that would most likely engage a child’s interest at this age are larger items such as bugs, plants, coins, etc. which additionally makes the stereo models a more practical buy. Children over 10 years old would most likely find a compound microscope to be of greater use as it is more ideal to observe objects that light passes through easily – take pond water for instance. Objects that are observed through a compound microscope usually have to be prepared on a slide first. These can be of great use for children with science class projects or upping their A-game at science fairs! If you were to look at the two types of microscopes side-by-side one of the main features you would probably notice is the difference in magnification. A stereo microscope typically magnifies at a maximum of 300x, while a compound microscope magnifies at up to 1,000x or greater. That’s not to say that a higher magnification is better; it just provides more clarity for viewing microscopic subjects and would probably not be ideal for viewing certain types of objects. So now that you have a basic understanding of the types of microscopes out there, you may have in mind what to look for. Here are some additional pointers to keep in mind when considering making a purchase on a microscope for kids. If you want a quality microscope (as most people would) the key is to look at the specifications. What are lenses made of? What is the material of the body/arm? A microscope that uses glass lenses will give you better clarity for viewing specimens over a plastic lens. As for durability, you would want to opt for a unit that is made of metal, or at least has a metal body and/or a metal arm for the eye piece. Consider what your child will be using the microscope for and how it will be used. A heavy microscope might offer better durability over a lighter one consisting of plastic parts, but it may not be ideal for younger children wanting to venture outdoors with it. If your little adventure seeker is hoping to take their microscope along for nature trips, look at the weight of it for something that is more practical. Likewise, look at the power source. Microscopes need some form of power for the light source so be sure it is battery-operated for portability. Most microscopes for kids come with accessories they’ll use for their observations so consider these when searching for a good value. For instance, if you know it will be used for examining microscopic particles in objects as with compound microscopes be sure it comes with slides and a slide cover to view them on. Some units come with prepared slides that are ready for viewing to try out the microscope, but you’ll want some blank slides also so they can observe things from their own discoveries. You may also see kits that include stains or dyes for use with slide specimens. If you’re looking for a kit for your child that comes with a stain just be sure it’s non-toxic. Additionally, look for kits that come with useful accessories to give your child optimal creativity and not just extras that will most likely not even get used. Provided with this information, the following products would be my top 3 choices in a microscope for kids overall based on their function, quality, best value for the money and overall consumer ratings. This book is highly recommended if buying a kids microscope. Whichever microscope you decide to buy I highly recommend purchasing a book entitled: The World of the Microscope. It provides a framework for kids to learn and understand about microscopes, not to mention all the cool and unique experiments it lays out for kids. If you just give your child a microscope in a box and expect them to go off and running you might be disappointed. Most kids need direction and concrete ideas or steps to follow. Remember, most of these microscopes are not toys so they aren’t as straightforward to use as building blocks or dolls. See our list of recommended accessories at the end of the article. Includes: 5 plain slides, 1 concavity (well) slide, 4 prepared slides, cover glass, plastic dropper, 2 bottles of stain, slide labels, lens paper, forceps, plastic test tube, plastic Petri dish, straight teasing needle. 10X eyepiece 4X, 10X, 40X Objectives. 40X, 100X & 400X Magnification. 2 LED lights, above and below. Contains glass and sharp instruments; Adult supervision is recommended. Full instruction manual and helpful hints included. View or download the MANUAL for the MFL-06. The most popular kids microscope on the market. In terms of a compound or a stereo microscope, this award-winner gives you the best of both worlds. It has dual LED illumination capabilities. This allows users to observe small, solid objects such as bugs or rocks using the top light as well as specimens that are prepared on a slide using the bottom light which shines through it. It is a little more advanced over your basic stereo microscope and recommended for children 9 and older. Just to be clear, this is an actual scientist-grade microscope. If you were looking for something that shies away from the ‘kiddie-toy versions’ this would be a great choice for older children and adults, alike! It uses real lenses made of optical glass that can magnify at 40x, 100x, and 400x. Not to be confused with those that claim to offer higher magnification, this microscope provides better clarity overall to allow users to look at solid objects as well as microscopic objects, such as blood cells. As an added bonus, the 10x magnification eyepiece can be removed to use as a magnifying glass when it’s turned over. It comes with 5 blank specimen slides and 4 prepared slides to observe specimens on as well as a slide cover and petri dish. Also included is a test tube, red and blue non-toxic stains, forceps, a plastic dropper, a teasing needle and other accessories that can be used for examining a variety of subjects. One desirable quality that I liked in particular for a microscope for kids is that, although plastic, it’s made with an impact-resistant construction that is also easily portable! The whole thing weighs only 3 pounds so it’s easy to carry around for adventurous explorers that like to take their science skills to new levels. It’s also battery operated. A complete set for kids. It has everything a child needs to get started. Large knobs make it easy for small hands to hold and use. This is another ideal microscope that offers the benefits of a top and bottom LED light for a duo combination to observe objects. This would be a fitting microscope for kids that are just beginning to learn about studying objects with a microscope because the kit comes with useful tools that will help them learn so if mom and dad know nothing about using a microscope, this is for you. It comes with an instruction manual that teaches children about the microscope as they become familiar with it and also guides them on how to use it for viewing objects and slides of specimens. There are 20 accessories in all that are included from prepared slides to demonstrate how to look at the cells of microscopic subjects to tweezers for dissecting small objects for viewing different sections. As children learn and become more familiar with using it, you may want to purchase additional slides. There are 3 objective lenses that are all optical-grade glass for viewing objects at 40x, 100x, and 400x, with the 10x ocular lens. The construction is pretty durable with a metal body and some plastic components. The aperture wheel is ideal for children to adjust the focus of the magnification so they can see clearly. An extended video over 10 minutes long. Watch! It also operates on 3 AA batteries so it can be taken around with them from the attic to the backyard! The recommended age for this microscope according to the manufacturer is 8 years and up; although, with some assistance I could easily see this as a very useful learning microscope for my 6 year old. In my opinion, this microscope has a more kid-friendly attractiveness to it that I find more appealing for kids. It is still a very real microscope for the use of biological observations, but seems more appropriate than the sterile-looking models that I would deem more appealing to pre-teens and middle-school aged students. Magnifications: 300X, 600X & 1200X. Includes: sample slides, cover slips, plastic tweezers, a plastic scalpel, specimen vials, adjustable lenses, collecting vials, plus a sturdy hard case for easy storage and travel. 300X, 600X and 1200X three magnification beginner microscope with metal construction. Illumination: built-in LED light and reflecting mirror. Battery compartment for 2 AA-size (included). Built-in rotating color filter wheel. Specimen stage with stage clips. Slide Holder: dual spring clips. Your child will have everything she needs to get started. If you are looking for a strictly compound microscope for kids that is a little more up to speed for educational purposes, this would be appropriate. I would find this more ideal for use by older children wanting to learn more about the study of objects at a molecular level. It uses LED and mirror illumination for viewing objects and has a built-in color filter wheel. The microscope is equipped with a metal arm to provide better durability and magnifies at 300x, 600x, and 1200x with a rotating turret. It is equipped with spring-action clips that hold slides in place on the specimen stage while viewing them. Along with the 49 pieces that are included, I was quite impressed that that it comes with brine shrimp eggs and a shrimp hatchery in the accessory set. This is pretty neat to allow young science enthusiasts to make interesting discoveries of organisms using their microscope that really puts it to the test. It’s amazing how much you get for so little money. This microscope also comes with its own hard case for storage. I especially like this so that the microscope can be safely stored away when not in use as well as keeping all of the pieces it comes with neatly organized. The optical lenses are made of plastic rather than glass, which may affect the clarity to a degree, but it’s still a fairly decent value for the price of a microscope for kids. Another notable attribute that is flawed is the mirror illumination, which is common in cheaper microscopes. This can pose a risk of eye strain in children when trying to focus as well as vision damage if used in the direction of the sun, which is another reason I’d recommend for older kids. Parental guidance is advised for children that intend on using this microscope while outdoors. Otherwise, it would be in your best interest to rely on the LED light. 1 shrimp hatchery, 1 specimen slicer, 5 prepared slides, 7 blank slides, 1 petri dish, 7 slide cover, 1 plastic tweezer, 1 graduated cylinder, 1 spare bulb, 7 statical slide covers, 7 slide labels, 1 plastic scalpel, 1 plastic spatula, 1 needle, 1 plastic stirring rod, 1 eosin, 1 gum media in a bottle, 1 sea salt, 1 brine shrimp eggs, 2 collecting vials, 2 AA batteries. Great for home schooling too! This is a perfect microscope for students to learn science. It comes with full optical glass elements, metal framework, 360 degree monocular head, coarse & fine focusing, mechanical stage, and LED illumination. It offers five magnification settings, 40X, 100X, 250X, 400X and 1000X. It is an ideal microscope for home school or for students from elementary to high school. It is also an excellent instrument for hobbyists. It is brand new in original box. A great introductory microscope for preschoolers. This is a good microscope for a young child. It’s more akin to a powerful magnifying class but it’s a great introductory kids microscope that will spark curiosity in young ones and encourage them to roam around the home and yard to find objects to view in detail. As adults we sometimes forget how imaginative kids are and all they need is a little nudge to get them excited. 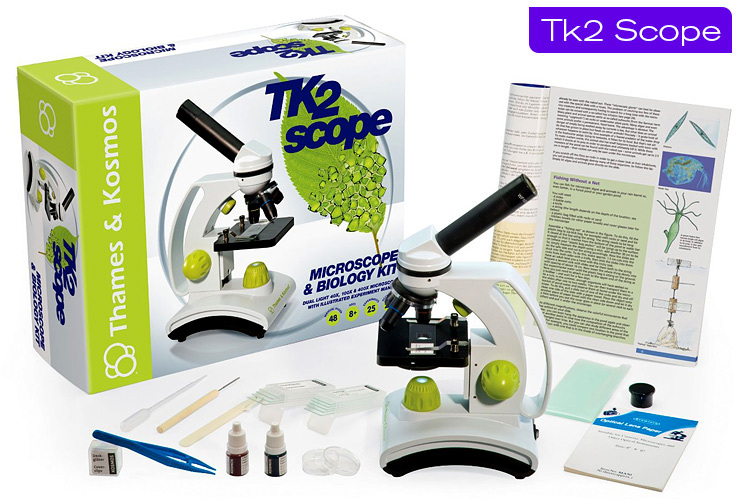 This is very inexpensive so if you have a child under 4 years old then it’s easy to recommend knowing that if they want more out of their microscope and retain their interest then just purchase one of the other kids microsopes in this article. Honestly, it’s under $15. The role of a parent is to encourage a child to pursue their natural instincts. My First Microscope is a great little microscope for young kids to introduce them to science — and a great learning tool for parents to start a discussion about the natural world. If you like this but would like a more powerful model for your child then you may be interested in: Learning Resources Primary Science Viewscope — It has 20x zoom. It’s a view scope, not really a microscope. It’s a hybrid. Actual working microscope. More than a toy. 2 extra-large eyepieces and a large focusing knob for small hands. Bright LED can be toggled with a push-button. See the subject clearly. 2 eyepieces eliminate the need to close 1 eye. Right-side up and left-right correct. Easy to focus. Small kids won’t have a problem with it. Dissecting microscope (view small objects like a leaf, rock or a spider. 30x, 100x, and 400x magnifications. This Nancy B’s Science Club Microscope is a fantastic inexpensive kit that kids will love. As you can see, all the marketing is geared towards girls, but don’t believe the marketing boys will love it just as much. Kids don’t care because they’re not as conditioned (yet) to follow stereotypes. 2-in-1 light and dissecting microscope gives up-close views—30x, 100x, and 400x magnifications—of anything you can imagine, from peacock feathers and goldfish scales to your own skin and cheek cells. The included keepsake journal features 22 pages of fun science experiments for kids and activities from observation to creative writing, drawing, and more. View or download the INSTRUCTION MANUAL for the Nancy B’s kids microscope. View or download the ACTIVITY JOURNAL for the Nancy B’s kids microscope. Test tube, Pipette, 7 Cover slips and slide labels, 4 Prepared slides, 7 Blank slides, Petri dish, Specimen vial, 22-Page activity journal. I love that this includes a journal. Self-learning is important for kids. Introduces kids to a real science tool. Conduct safe and fun science experiments/activities. Promotes analytical thinking and problem solving. Get your children interested in science. Get your kid something meaningful this Christmas and help shift their life toward the pursuit of knowledge and discovery. A wonderful package that includes everything a child needs to start. 2-in-1 40x-100x-400x — Monocular Compound Dual LED Microscope Gift Package — Ideal for Elementary and Middle School students. Includes: Includes: 5 blank slides, 5 prepared slides, 10 cover slips, microtome, red dye stain, blue dye stain, test tube, lens paper, 2 specimen sticks, plastic pipette, tweezers, petri dish, 5 slide labels, dust cover, manual. PLUS : Usborne’s, The World of the Microscope book, Eosin Y stain, 1%, 15 ml, Methylene Blue Stain, 1%, 15 ml, , 4oz Sparkle Lens Cleaning Fluid, 50 Premium Blank Slides, 100 Slide Covers – 22mm x 22mm, 3 Well Slides, 5 Prepared Slides, Dropper or Pipette, Lens Cleaning paper, 3 cc Immersion Oil A, 25pc Plastic slide storage case (Note: case may be white or green), Instruction Booklet. High power microscope for viewing slides; this particular model can also function as a monocular dissecting microscope for viewing larger, solid specimens such as insects, coins and and plants. Made with glass optics and variable cool LED illumination, it’s a perfect gift for elementary and Middle School students — providing them with all the tools they need to learn and discover. A wide field WF10x eyepiece combines with three achromatic objective lenses, 4x, 10x and 40x to provide magnification of 40x, 100x and 400x. Designed with an eyepiece lock nut that can be tightened to reduce the risk of loss. The head rotates 360 degrees for complete control. A plain, flat top stage offers two slide clips to secure specimen slides. Rack and pinion focus includes coaxial coarse/fine controls that are dual-sided for convenience. Has a rack stop and slip clutch to prevent accidental damage. Six hole pinhole aperture for illumination control and the resolution quality (fine details) provided is fantastic. A filter holder is provided for optimal adjustments. Upper and lower LED illumination with variable light intensity (requires 3 AA batteries). The LED lights are energy efficient and can run a long time making this microscope a great companion on field trips. Three magnification levels: 40x, 100x, 400x. Dual use for microscope slides and macro specimens. Portable – Dual LED illumination. Includes a starter pack of accessories plus optional add-on accessory kits. Interactive learning for kids. The talking feature is a cool addition. If you’re looking for a real microscope, this isn’t it. It’s more of a toy but it’s still a good introduction to science. Just be ready to upgrade to a real microscope in the near future. The prepared slides are pictures of bugs and not real slides. It only has 5x magnification so it’s more like a magnifying glass. View or download the MANUAL for the GeoSafari Talking Microscope. A cool and unique first microscope! Great for introducing scientific observation. Features a dial children can turn to listen to fun facts about what they’re seeing on the slides. Comes with a built-in electronic quiz game. Explore 12 interesting bugs up close, hear cool bug facts, and test your knowledge of each creepy critter in fun quiz games. Features 5x focusing magnifier and light for easy viewing. 2003 Educational Toy of the Year Award Nomination – Toy Industry Assoc., Inc.
A great gift for any young child. View or download the MANUAL for the Educational Insights MicroPro. In today’s technological world, every field of science utilizes microscopes. Microscopes are used by biologists for studying microorganisms, by geologists for studying rocks and minerals, by archaeologists for studying ancient artifacts, and by astronomers for studying fallen meteorites. With the Education Insights MicroPro, young kids can explore the world they live in and analyze each item up to 600x magnification. Even though this is for young kids it’s still capable of seeing objects at the cellular level. It has a built-in light (as any good microscope should) and a rack-and-pinion mechanism for focusing, enabling your child to view bright, clear images. This 48-piece kit has professionally prepared slides and everything required for a kid to make their own specimen slides. This is not a toy, but a real working scientific instrument. Made with high-quality components and features that make it appropriate for science learning at any age. Requires 2 AA batteries for light (not included). Includes: 1 – Die-cast Metal Microscope, (1) 10X Eyepiece, (1) 20X Eyepiece, (1) Scalpel, (1) Spatula, (1) Stirring Rod, (1) Tweezers, (1) Test Tube with Cap, (1)– Petri Dish, (1) Pipette, (3) Specimen Vials, (3) Prepared Slides, (8) Blank Slides, (8) Slide Labels, (16) Slide Covers. Let’s analyze the world around us. A very meaningful gift for kids. The most important parts of your microscope are the lenses. Handle them with care. If the lenses are dirty or dusty, you can clean them with a soft cotton cloth or a special lens cleaning tissue. Do not wipe them with a finger or a regular facial tissue. Avoid any direct contact between the viewing lenses and the stage. When changing eyepieces, work carefully, but quickly, to avoid introducing dust into your microscope. Always return the lens cap to the eyepiece when finished. If you are searching for a meaningful gift idea, be it for a birthday or Christmas, a microscope for kids can have so much more to offer than traditional gifts. Finding things to look at and observe is a wonderful way to encourage kids to explore and learn. I must say, it’s equally fun for parents to join in with their kids for observing different things.